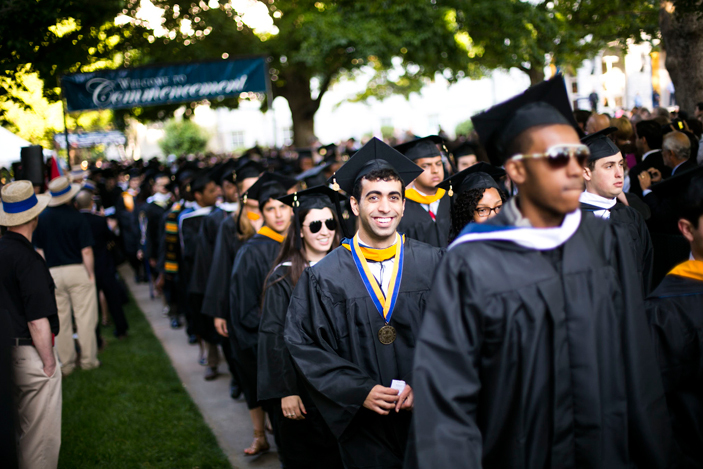 Graduates prepare for Emory's 168th Commencement ceremony, which took place Monday, May 13, 2013. 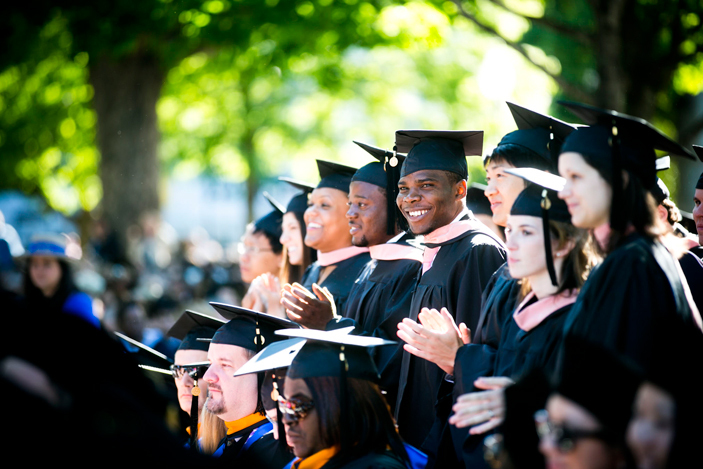 The day's ceremonies unfolded on a cool spring morning, with some 4,149 graduates streaming on to the Emory Quadrangle for the annual conferral of degrees. 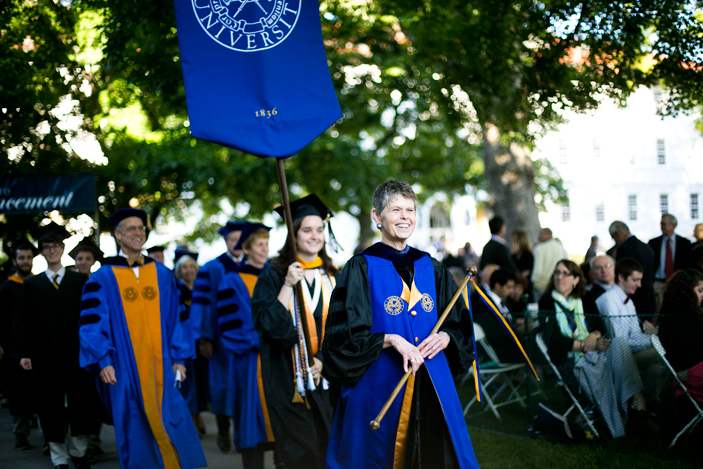 Professor Bobbi Patterson, the first female Chief University Marshal, led the procession. 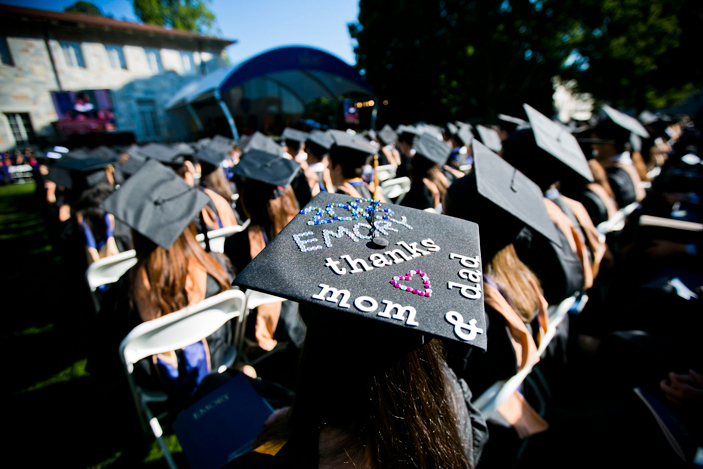 The Class of 2013 earned Emory national recognition on the President's Higher Education Honor Roll of Community Service and as a top contributor to both Teach For America and the Peace Corps. 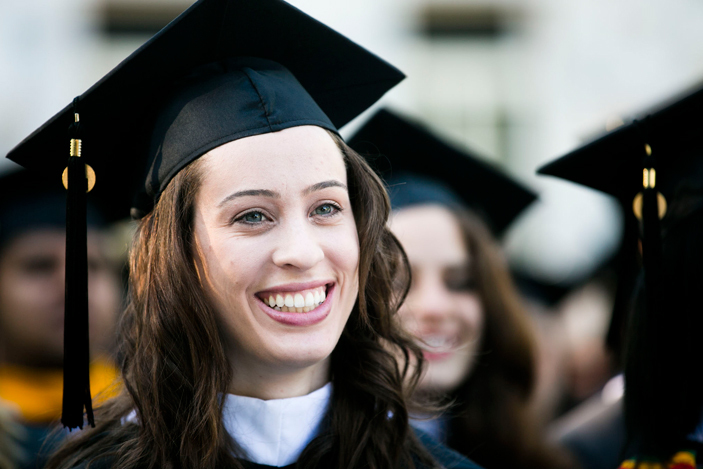 About 56 percent of all the graduates were women. 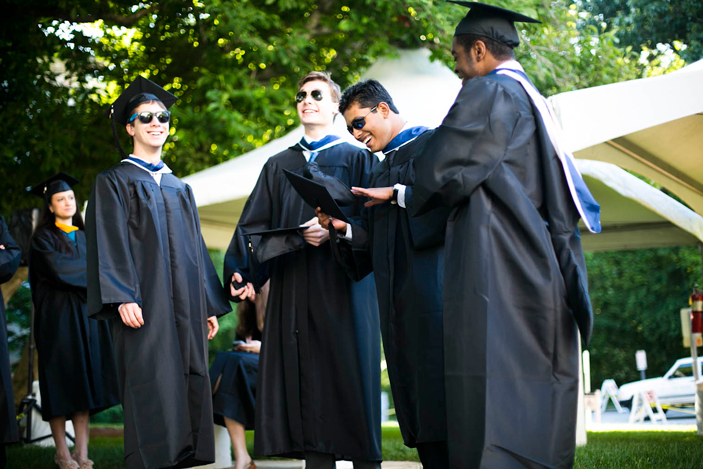 Seventy-one countries and 47 U.S. states were represented in the Class of 2013. Keynote speaker Rita Dove asked graduates to look upon the day as a "rare moment when you get a chance to reflect on your life and stop, for just an instant, and think where you have come from and where you are going to." 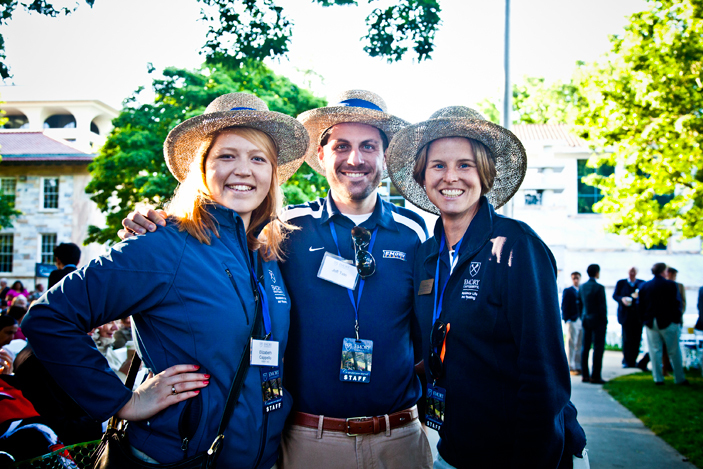 More than 200 volunteers helped on Commencement Day. The keynote address was delivered by former U.S. Poet Laureate and Pulitzer Prize-winner Rita Dove. 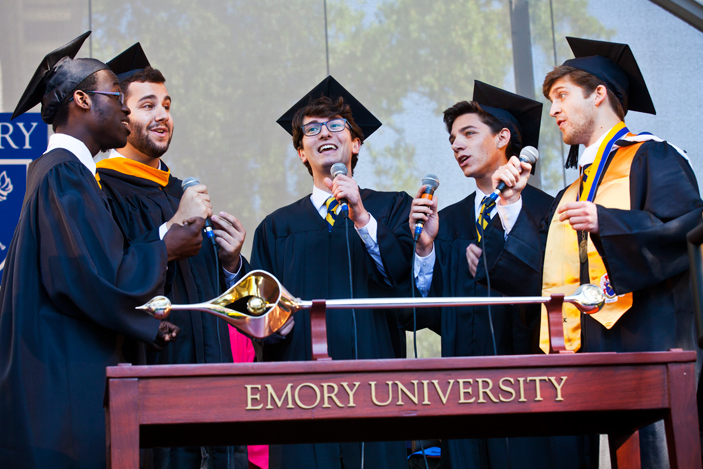 Emory's a capella group "No Strings Attached" closed the ceremony with the university's alma mater. The day's ceremonies unfolded on a cool spring morning, with some 4,149 graduates streaming onto the Emory Quadrangle for the annual conferral of degrees. Photos by Emory Photo/Video. From set up to grads tossing their caps, seven hours of ceremony captured in two minutes. Demonstrating academic excellence, creative innovation and compassion, the Class of 2013 was recognized by Emory President James Wagner both for its achievements in the classroom and humanitarian endeavors far from campus during the University's 168th Commencement ceremony on Monday, May 13. 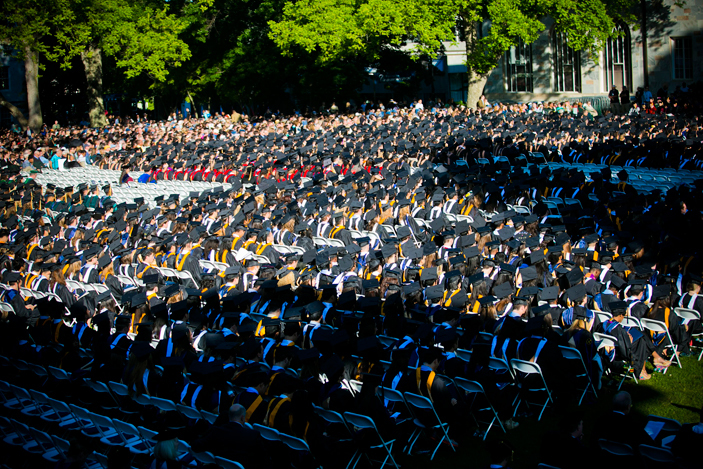 Addressing a crowd of about 15,000 students, families and supporters gathered for the celebration, Wagner observed that each graduating class seems to have a distinctive identity. "It's a little difficult to sum up in one word, but if I had to put my finger on it, the quality or characteristic of you, this year's graduates, might be resilience," he said. Wagner said that the Class of 2013 had arrived at Emory in 2009, a year after the launch of a worldwide economic meltdown. "Many of you and your families had to adjust expectations about what could be contributed in paying for your education," he recalled. "Many of you ended up working extra hours. "But besides these economic circumstances, you weathered other challenges and you bounced back resiliently." From students who "endured isolation in the swine flu dormitory" during their first semester to those responding to a world shaken by earthquakes in Haiti, a tsunami in Japan and recent bombings in Boston, Wagner commended graduates for their ability to demonstrate "wonderful responsiveness to other people's needs." Earning Emory national recognition on the President's Higher Education Honor Roll of Community Service and as a top contributor to both Teach For America and the Peace Corps. Winning national championships for men's tennis and women's swimming and diving teams. "You proved that you are not only tough — that is, bending but not breaking — but also creative and compassionate," he added. "And all of that shows in your resilience." 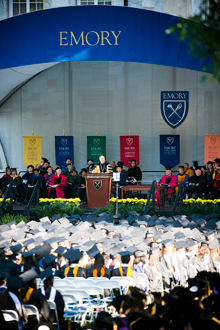 President James Wagner spoke of the resilience of the Class of 2013. The day's ceremonies unfolded on a cool spring morning, with some 4,149 graduates streaming on to the Emory Quadrangle for the annual conferral of degrees — a joyful procession infused with colorful academic regalia and time-honored traditions. Graduates entered from every corner of the Quad, a diverse, lively river of humanity — waving to parents, sharing proud smiles or appearing stoic behind sunglasses, all the while, taking photographs to capture the hard-earned achievement one last time. Parents and friends began arriving before sunrise to secure good seats to view the festivities — a quest eased this year by the large LED video screens flanking either side of the main stage. And for both the graduates and the legions of visitors supporting them, it was a scene both moving and rewarding. "By the time my son was 11 years old, he knew he wanted to become a doctor and he knew he wanted to go to Emory," recalled Sarah Cochran, whose son, Sam Cochran, was graduating from Emory College of Arts and Sciences with degrees in Spanish and biology. Not only did Cochran see his dream fulfilled, his mother noted, he soon joined Emory EMS, a student-run, volunteer quick response team. He leaves Emory after serving as chief of operations with plans to apply to medical school. Throughout the day, parents and graduates shared stories of dreams realized. Mica Koli is being considered for ordinance in the Lutheran Church. Lucy Anderson has a Fulbright grant to do environmental research in India. Tess Komarek has plans to join the Peace Corps. Alexandra Whalen is heading to veterinary school; Scott Weiner is headed to a job in finance in New York City. And on it went — a day built around celebrating the possible. The ceremony also highlighted the conferral of honorary degrees for students and faculty, awards that recognized community service, leadership, teaching and mentorship. Katie Dickerson was presented with the Marion Luther Brittain Service Award, Emory's highest honor for service and leadership; Leslie Harris earned the University Scholar/Teacher Award; and Nadine Kaslow was given the Thomas Jefferson Award. Humanitarian Marguerite "Maggy" Barankitse was awarded a doctor of humane letters for her work on behalf of victims of violence in the central African country of Burundi. Architect Michael Graves was presented a doctor of fine arts for redefining the architect's role in society through four decades of influential design contributions. Former U.S. 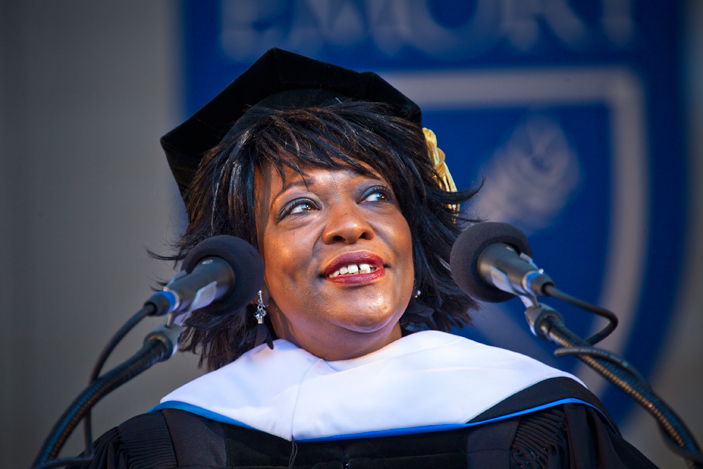 Poet Laureate Rita Dove was given a doctor of letters for her contributions to American and African American literature. In her role as Commencement keynote speaker, Dove urged graduates to celebrate the gifts of a liberal arts education. "As you prepare to enter the workplace or move toward further studies, or plan on travelling the continents, I fervently hope that you will remember and stand firm in defending this legacy of education against threats of fiscal strain and the smug posturing of those souls who shrug off the arts and humanities as a waste of money," Dove said. "In a democratic society, the arts are deeply intertwined with knowledge and progress," Dove noted. "Digging up earth from one corner of a foundation to bolster another might provide short-term relief, but as any building contractor can tell you, sooner or later such an edifice is sure to collapse." Dove asked graduates to look upon the day as a "rare moment when you get a chance to reflect on your life and stop, for just an instant, and think where you have come from and where you are going to." In her own life, she recalled just such a moment: On April 16, 1987, Dove was sweeping her kitchen in Tempe, Ariz., preparing for a surprise birthday party for her husband, when her department chair called with news that she'd been awarded the Pulitzer Prize for poetry. After the news sunk in and she found her voice, Dove asked, "What next?" She learned that a press conference had been arranged for that afternoon. When Dove protested that she didn't know "how to give a press conference," her department chair "answered with two words that have resonated within me ever since: 'You'll learn.'" "I've often thought back to that moment, because it was one of those rare points in time when one feels the passage from one phase of life to another," Dove explained. "And as with most rites of passage, I was terrified and felt wholly inadequate, and yet the protocol of the situation demanded that I act happy and confident — you might know how that feels, you might be experiencing some of that right now." Dove reminded graduates that up until this day, they had conducted much of their studies "in solitude and quiet . . . You've nursed your dreams and done your labor, and here you are now in the balm of a chilly morning receiving your laurels, public proof of work well done." "The door has opened," she said. "What is on the other side and how will you meet it? The simple answer: You'll learn."